Saturday my oldest daughter was married. Surrounded by family and friends, we celebrated the beginning of a journey, two young people venturing forth into a new life together. An amazing handmade lace tablecloth came along for the party. This beautiful domestic linen belonged to my maternal grandmother and graced her huge mahogany dining set. We gave it pride of place on a liquid-free welcome table, set with childhood photos of the bride and groom, some Jordan almonds and the seating chart. Handmade lace tablecloth, from the Chicago home of my grandmother. This is a really big cloth, easily covering the standard 8 foot rectangular dining table, with some amazing handwork, in perfect condition. I especially like the cupid motif around the edges, shown in the detail below. Women save these special textiles, hoping to have the special occasion to use them, kept safe in our cupboards and closets as reminders of the family matriarchs. Grandma didn't make this, but she sure had an eye for beautiful things. It may yet see the light of day again in my lifetime for my other daughters and niece. We had some serious flooding here in South Bend, and after the 6-8 inches of water in the basement drained off and we dried the place out, I decided to go through the plastic tubs that were labeled "kids art." Had we not had that flood, I would never have found this gem, made by my daughter all those years ago. To be honest, she was not a very princess-y girl, but did go through an artistic period of queens, princesses and brides, of which this is a surviving example. I framed this and had it on that welcome table too. So, many happy moments, memories and hopes. I am writing this post, then heading to the studio to resume my art life! Shape Garden 1, from the Standing Amazed series, is on view in the Woman Made Midwest Open through March 24. Woman Made Gallery has recently moved to 2150 S. Canalport, Chicago. If you follow the link you can see all the work selected for the exhibition. The stars are not going to align for me to be able to see the show, but I am hoping that my daughters that live in Chicago will be able to get over to see it. Busy month ahead, I have a whole list of entry possibilities, I need to take some photos (my least favorite job) and write some proposals and statements. Maybe I can squeeze in some sewing! Here are a few of the titles I have recently read: American Rust, by Philipp Meyer; Bluebird, Bluebird, by Attica Locke; Elmet, by Fiona Mozley; Heart Spring Mountain, by Robin MacArthur; and The Story of Arthur Truluv, by Elizabeth Berg. I checked out this slim little volume at the library a couple of weeks ago. Since my father's passing at new year, and my mother's last spring, my sisters and I are faced with the dispersal of a lifetime of stuff from the family home. The questions around what people choose to keep and what they eventually let go of, are central to my practice as an artist. Most of the materials I use, even the threads, have lived in other places, been kept by someone, for some reason. So much of it came from the basement and closets of the same home we are now cleaning out, piece by piece. In the book, Margareta Magnusson is advocating we do our "death cleaning" before we die. I'm on board. Deep breath. Mother Nature and climate change did some of my stuff reduction for me. In the late summer of 2016, we had 11 or 12 inches of rain in as many hours, unprecedented, and in amounts that our aging storm sewers could not handle. For the first time in the 30 years we have lived in our 1920 house, the basement flooded, badly. The water receded quickly, leaving behind a sodden mess. A lot of the wet stuff was paper--mat board and cardboard, college papers from the whole family, notebooks, lesson plans, my high school diploma, college portfolio, yearbooks, 35 years of National Geographic; all hard to discard when dry, not salvageable when wet. There is more to be done down there, but the total was reduced by at least half. We also have a walk-up attic, full of carelessly stashed stuff. Another deep breath. I have been working on a large series of work focused on laundry. Based on fragments from a dozen found white men's dress shirts, cotton and wrinkly, this series is yet another chapter in the history of toil. The white shirts were a perfect canvas for mark-making and fabric manipulation. Dr. Ruth R. Benerito, a chemist working for the USDA, is credited with the discovery and development of wrinkle-free cotton and permanent press fabrics. No surprise this revolutionary idea was pioneered by a woman. More on this series to come. Here are a few titles from my 2018 reading: The Music Shop, by Rachel Joyce; The Exact Nature of Our Wrongs, by Janet Peery; In the Midst of Winter, by Isabel Allende; and a blast from the past, Birdy, by William Wharton. Mike and I spent the winter solstice eve at a special "Here Comes the Sun" performance by Molly Moon and Riley O'Conner as a benefit for new solar panels on the roof of the Purple Porch Food Co-op--how crunchy is that? This was a fun evening, followed by a fresh snow on Christmas Eve that left us with about eight lovely white inches on the ground. Now, a few days later, we are staying warm indoors as the temperatures go into digits minus zero. Winter in northern Indiana is a time for making things with wool. I like to have some portable projects for when I am a passenger in the car, or just watching the news or a movie at home. I unearthed a horde of single and damaged work gloves in my parent's basement and then cut them in half and embroidered them to tweedy whole cloth with wool tapestry yarn. Who knows why so many gloves were saved (there are dozens, all colors, sizes and fibers), or what possible purpose they were intended for, but here I am, finding a purpose for them! These are evidence of the power of depression-era thinking. I know I have not yet found them all. Many of my friends have passed on to me other textile caches, found when they eventually needed to empty the family home for sale. Those are artifacts often loaded with memory and grief, but these gloves, they' re just wacky. I reread The Handmaid's Tale, by Margaret Atwood. I read it in the 80's, and it was just as chilling in 2017. Also, The House Among the Trees, by Julia Glass, The Rules of Magic, by Alice Hoffman, Future Home of the Living God, by Louise Erdrich, Under a Pole Star, by Stef Penney, and State of Wonder, by Ann Patchett. I have been working with the theme of women and toil for a number of years. I read a novel, The Museum of Extraordinary Things, by Alice Hoffman, that was set at the time of the Triangle Shirtwaist Factory fire in New York City, and this sparked a year of research about the fire, including photos, first person accounts and primary source documents. This is a story that touches on many issues relevant today. It is a story that made me sad and angry. Of the 146 people who died in the fire, almost all were young women and teenage girls, recent immigrants from Italy and eastern Europe. Working long hours, for a few dollars a week, most of these girls were helping to support their families, looking forward to new lives in a new country. The tragedy fueled activism by the International Ladies Garment Workers Union as well as other groups of advocates for worker safety and improved working conditions in the garment trade. We should know more about this fire, we should remember what unregulated corporate greed looks like. The Cornell University IRL School has a comprehensive research collection online, with a wealth of information about the fire, all in one place. I had a delicate cotton shirtwaist blouse in my archives, given to me as a child by a friend of my grandmother for dress-up clothes. Somehow it survived these many years and I could use it in the quilts I made for this project. This was emotionally difficult work to do. I was very pleased to have two quilts accepted for exhibit in Quilts=Art=Quilts at the Schweinfurth Art Center in Auburn NY, where they will be on display through the end of the year. There are many other wonderful quilts in this exhibit, and the Schweinfurth has made a video available to show how they have been displayed. The exhibit Interpretations: Conversations opened this weekend in San Diego at Visions Museum, on view through January 7, 2018. My quilt, Outspoken, was selected for this juried show and is part of a series of work I created that draws from my experience teaching middle school art. "Words out loud, speaking the change from child to adult, noisy with energy and emotion, unconstrained by the buttons of a middle-school uniform". Here are some books I have read lately: The Ministry of Utmost Happiness, by Arundhati Roy; How to Behave in a Crowd, by Camille Bordas; Do Not Become Alarmed, by Maile Meloy; Crossing to Safety, by Wallace Stegner; The Plover, by Brian Doyle. I often listen to audio books when I am sewing, and always have a paper book going at the same time. Another fall, two more fractures. My father is breaking apart, body and mind. So, the fragile nature of bones is in my mind. Last summer I made a number of pieces of cloth using cyanotype chemicals and plastic Halloween skeletons. I really love the deep blue that results when the treated cloth is exposed to sunlight. I used an old cotton tablecloth, as well as a few other household textiles of unknown origin, just small pieces to make the process manageable. I brought these cloth pieces and a bunch of other fabric in a laundry basket and drove, once again to Michigan, and set up a mobile studio in the home of my childhood. I wanted to do a little machine piecing, but did not bring my Featherweight, so I went to the basement and found yet another salvaged sewing machine. This one looks like it was a treadle model, later put in a portable case and rigged for electricity. What could I do but plug it in? Works like a charm, has that great old sewing machine smell too. And a beautiful straight stitch, with perfect tension. May I also mention the elaborate gold decals, with Egyptian theme? I checked the serial number on the internet and found out it was originally made in Elizabeth, NJ, in 1904. Singer, made Elizabeth, NJ, 1904. Now I am working with this cloth, trying different ideas, searching for a way to put an image together. I have been on the road a lot, back and forth to Michigan. My 93 year old father broke his hip two weeks ago and I have been trading off responsibilities with my sisters while he is at the rehab center and we try to sort out next steps. I bring a studio in a laundry basket when I come, but have found it hard to focus. I am working on a boro style playmat for my new baby grandson, so that is pleasant, repetitive work. I was going for something like sashiko stitching, but I am not precise enough for the real deal. The back is a lovely piece of woven cloth from Guatemala. The piece below, originally made for a Women's Caucus for Art show, is on view in Ann Arbor, at the University of Michigan Stamps School Alumni Exhibit. This is a work constructed from an old cotton red-orange work shirt I wore years ago, deconstructed, then reimagined in a boro style with a lot of my favorite indigo blue. I discovered the traditional boro textiles from Japan a few years ago on Pinterest. The mended and patched beauty of this cloth is an aesthetic that resonates for me on many levels. Boro Shape Shifting 1, was constructed improvisationally, working with fabrics I had on hand. I made some marks on the red shirt with fabric paint, then embroidered in the negative spaces. Sometimes it looks to me like the red figures are little pokemon-type anime characters. One of my favorite art units for middle grade students was to create anime characters, with unique personalities and powers. We would do some guided drawing lessons, (me on the overhead, students on paper), and practice different head and body shapes, features, extremities...then later mix it up into something new of their own. Teaching is a lot like shape shifting sometimes. Boro Shape Shifting 1 can be seen at the Stamps Gallery, 201 S. Division St., Ann Arbor, MI, from July 18 through August 17, 2017. Check out all the works on exhibit at the link below. Last week we drove from Indiana to Denver to help our youngest get settled in her new apartment and visit with family and friends. I had the opportunity to go to the Lincoln Center in Fort Collins for the opening of the 35th Annual New Legacies quilt exhibit. Here is a photo of the piece I have in the show. There are many interesting and innovative works by wonderful fiber artists on view and I was honored to be included. This is a pretty large piece, 44 x 46", and it has large chunks of machine piecing, as well as a bound edge, unusual for me. I have recently made a series of works embroidered on school uniform shirts, sewn to whole cloth and mounted on canvas stretchers. Out Loud is an extension of that series, based on my experiences teaching middle school art. I am the low-key, quiet type, so the noise level of middle school was somewhat jarring, and the unedited things kids would say was often surprising. I think this quilt has a pretty chaotic visual noise level, and the large ivory and black print, sliced and randomly rearranged, then pieced together again, looks like language to me. 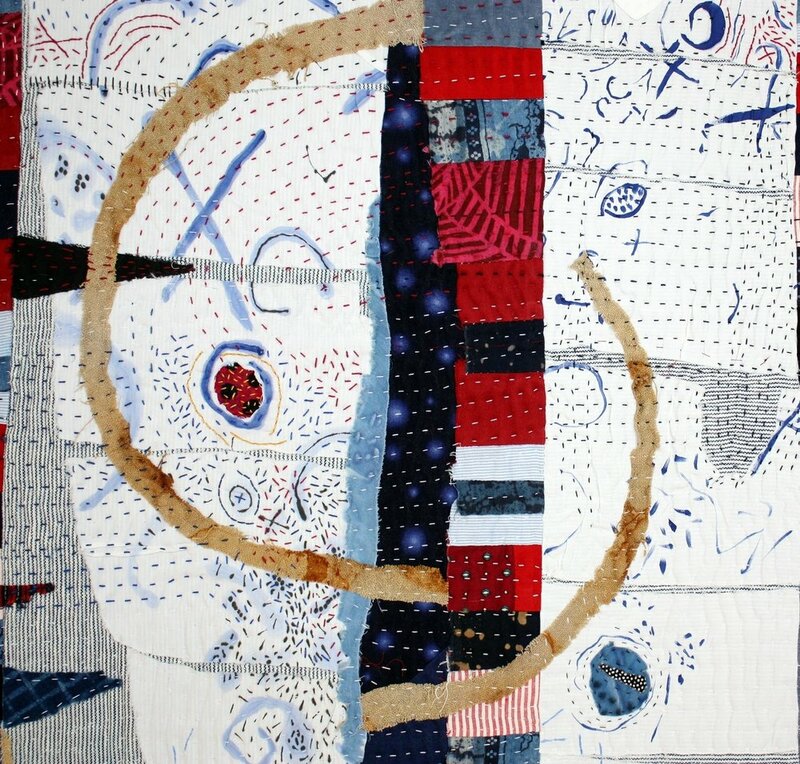 Out Loud can be seen at the Lincoln Center, Fort Collins, CO in the 35th New Legacies: Contemporary Art Quilts exhibit, through August 26, 2017. It is summer, and my taste sometimes runs to mysteries and thrillers: Into the Water, by Paula Hawkins, I Found You, by Lisa Jewell, Mercy Snow, by Tiffany Baker, and a great book that came out years ago, by a favorite author, Behind the Scenes in the Museum, by Kate Atkinson. Selections from my sizeable collection of mid-century tablecloths and cutwork napkins are the backdrop for one chapter in the History of Toil series. Think about those stressful holiday meals, with mothers, daughters, sisters and sisters-in-law all swirling around a small kitchen, orchestrating a culinary production that will take days and hours of effort, and be consumed in only minutes. Families are complicated, and often these meals, though tasty, come fully loaded with undercurrents of conflict and unspoken tensions. These works each make reference to traditional quilt patterns and structures. In Broken Dishes, I used the hourglass block form, repeating it in various sizes and positions. The white tablecloth with blue and magenta print was stained and mended, but I preserved parts of the corner motifs (a woman in a hoopskirt, holding a parasol in one hand and the leash of a small dog in the other). The linen napkin has been solar-dyed. My palette of fabrics include cheerful checks, polka dots and apron prints; accented by deep indigo and black shards, the darker side of women's work. Centerpiece uses another print tablecloth, over-dyed in indigo, as well as fragments from a found grandmother's garden quilt top. There is a spiderweb embroidered over the hexagonal block, maybe to emphasize the connections between women, maybe to suggest an element of entrapment? The idea of a busy hive of workers, with a central, unquestioned matriarch, resonated for me. I was never that woman. In fact, in almost 40 years of marriage, this past Christmas Day was the first I have spent in my own home. We always traveled back to Michigan, where I was happy to play supporting cast in the annual mealtime dramas. "Why don't you bring a salad, Helen"? I loved the depression-era pink of the quilt top background when I saw it hanging on a line at a yard sale years ago. I used this as a bedspread for a few years, but all the lovely yellow rayon pieces soon began to deteriorate. This is a big quilt top and there is a lot left over, so other fragments will likely appear in future works. This month I have been reading Lucky Us, by Amy Bloom, Anything is Possible, by Elizabeth Strout ,The Mysteries of Pittsburgh, by Michael Chabon, The Stars are Fire, by Anita Shreve, and The End of the Wasp Season, by Denise Mina.